As people walk down toward it, the dark structure bearing 58,272 names prompts memories, prayers and quiet tears. Visitors take photos, leave flowers and gifts — a surprise to the planners — and even make rubbings of names to take home. 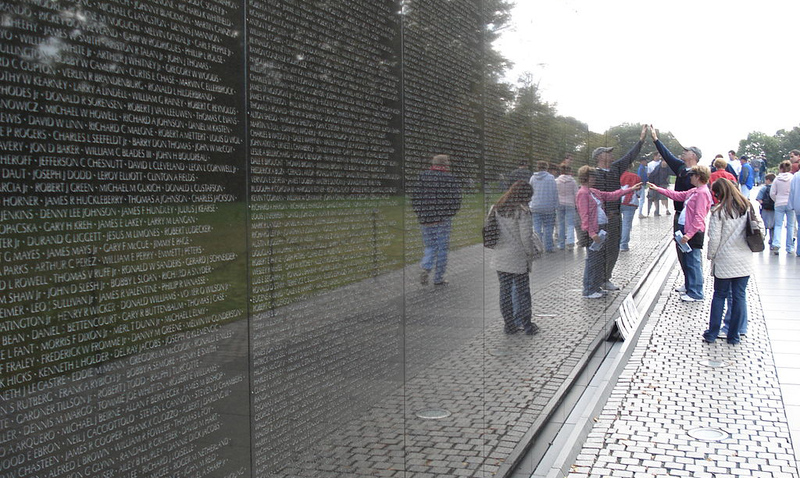 The Vietnam Veteran’s Memorial in Washington, D.C., designed by then-architect student Maya Lin and installed in 1982, is many things to many people. To Joe Janes of the Information School, the son of a World War II veteran and creator of the Documents that Changed the World podcast series, the memorial, the discussions it sparked and the hearts it helps heal — “the totality of the wall” he says – together comprise an important document. He said he got the idea for this installment while watching a PBS documentary about the National Mall, which mentioned the famous memorial. Lin’s design was chosen from among 1,421 anonymous entries in a unanimous vote by an “expert” jury that, Janes notes, included not a single veteran. Her submission, number 1026, described the proposed memorial as “a rift in the earth.” Later, Janes notes, the memorial was also called “a black gash of shame.” Lin did the work for a class project for which, though it seems incredible in hindsight, she got a B. The 58-272 names are carved in granite from India — offers of stone from Canada and Sweden were not accepted as those nations had shielded American draft evaders during the conflict. The first of those offerings, Janes says, was said to have been added by a naval officer who threw his brother’s Purple Heart medal into the trench where concrete was being poured for the memorial’s foundation. Many thousands of gifts have been left, Janes says in the podcast, and most end up at the Museum and Archaeological Regional Storage Facility in Maryland. But above all, there are the names, “each one documenting a life gone or missing,” Janes says.